More and more people are choosing modern decor to decorate their homes or businesses. Brushed chrome wall lights are the perfect style of interior wall lights for those ultra modern decors. Modern wall light fittings are made using different types of materials including glass, ceramics, plastic aluminium, brushed aluminium, chrome and brushed chrome as well as other materials such as wrought iron and brass. Brushed chrome wall lights have become a favourite among homes and businesses that choose modern decors do the fact that this type of interior wall lights have a clean modern look and fit perfectly in any room of the home or business and will look great with any colour or design theme. There are various types of brushed chrome wall lights that can be used in various areas of your home. Here is a look at some of the different types of wall light fittings available on today’s market. Stair case interior wall lights- brushed chrome wall lights made for staircases are normally low wattage and designed to fit low on the wall above stair treads or in the front of the stairs themselves. This type of lighting is designed to increase safety and to show off the architectural aspects of staircase. They make terrific effect lighting for those looking for a more dramatic look to their home. Hallway or wall light Fittings- There are a variety of different brushed chrome wall lights for hallways and walls of various rooms. Wall lights are a great way to light up various areas of your home and works well for those creating a layered lighting effect. There are chrome wall lights that provide up lighting, down lighting, and even four way lighting so that you can choose the light that you want and need to accomplish whatever your lighting goal may be. All of our lights use the latest LED technology so you can rest assured that any light you purchase from us is going to provide all the best that LED lights have to offer. Our LED lighting is energy efficient using less energy than more traditional types of lighting. 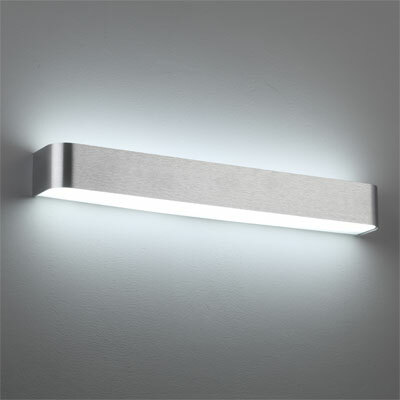 Our LED brushed chrome wall lights are long lasting providing you with over 20,000 hours of lighting before the light ever needs to be changed. Our LED lights are low maintenance since there are never any light bulbs that need to be changed. Our LED interior wall lights are environmentally friendly since they take less energy to run and are 100% recyclable. If you are looking for high quality brushed chrome wall lights then visit our website or give us a call at 0800-678-5156. And please make sure that all lights are installed by a qualified professional.